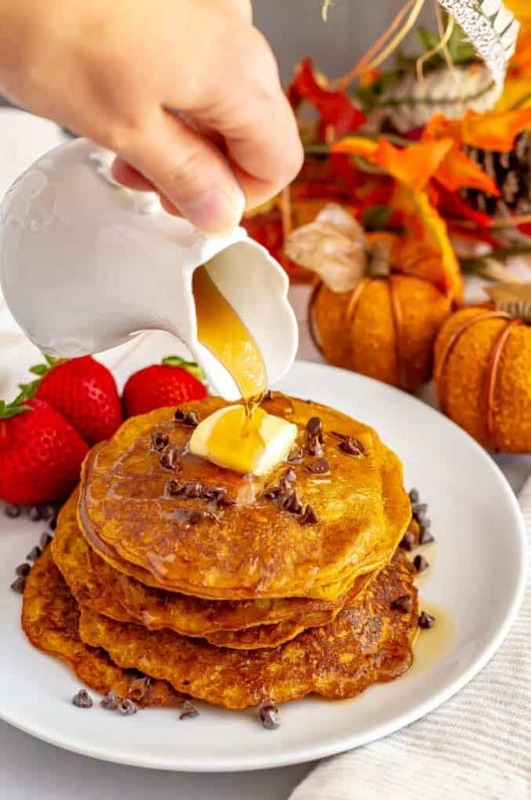 Whole wheat pumpkin pancakes are light, fluffy and full of warm spices and pumpkin flavor. 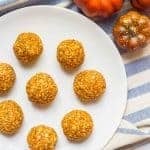 They are naturally sweetened (and can be made vegan) and are perfect for a delicious fall breakfast! Hiya friends! Did you have a good weekend? Is it starting to feel like fall where you are? It’s definitely cooling off here in the South, but we’re still getting plenty of warm, humid days, so I’m hanging in there for the real fall weather. 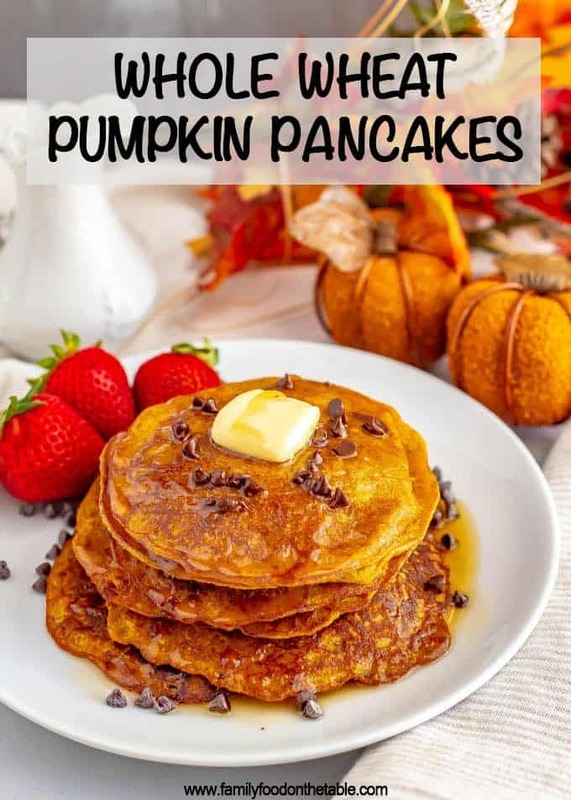 Today, I’m bringing the PUMPKIN love with these whole wheat pumpkin pancakes! I finally got them just right though! 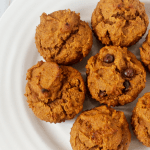 These are nice and light and fluffy and the perfect amount of warm spices and pumpkin flavor. I use white whole wheat flour, but you can also use regular whole wheat flour or even all-purpose flour instead. One trick for cooking pancakes is making sure you don’t overmix the batter. It’s OK to have a few small lumps. Another trick is patiently waiting to flip. You’ll start to see little bubbles form around the edges of the pancakes and then in the middle – this let’s you know the bottom is set and you are ready to flip. Also, keep an eye on your heat. I start at medium but usually back down to medium low as I’m doing the second and third batch of pancakes because the pan gets so hot. I often use two big sauté pans so I can cook twice as many pancakes at once. I’m impatient that way. 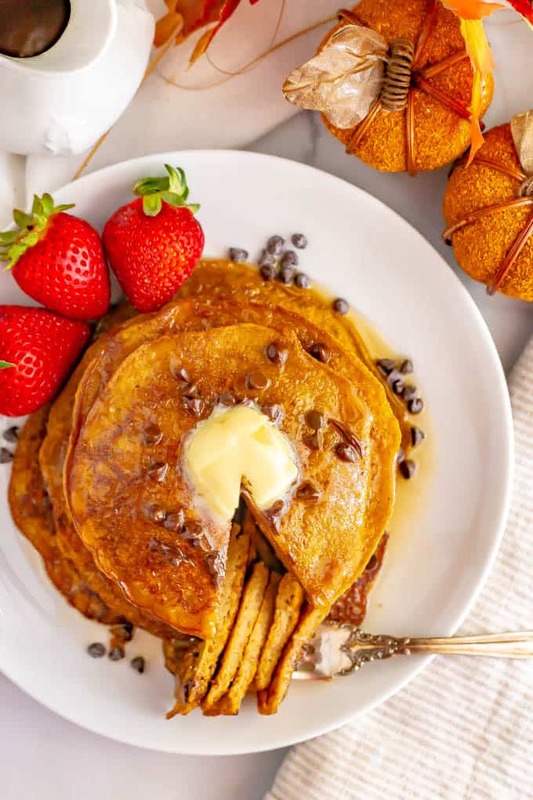 To make vegan pumpkin pancakes, you can substitute coconut oil for the butter (or applesauce for a lower-fat version) and use a flax egg in place of the egg. Leftovers freeze great! 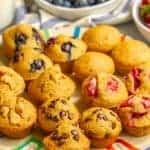 I let them cool completely then pop them in a freezer-safe ziptop bag and store them for up to 3 months. Want to take these over the top? Make a pumpkin pancake cake! 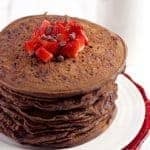 Use closer to 1/2 cup of batter for each pancake to make larger ones. (They will take longer to cook so be patient.) Place one on a plate and sprinkle it with mini chocolate chips. Keep adding pancakes and chocolate chips. Microwave the whole thing for about 45 seconds to a minute, until the chocolate chips are melting. Top it with butter, drizzle with maple syrup and then you can slice it up and serve a crowd! 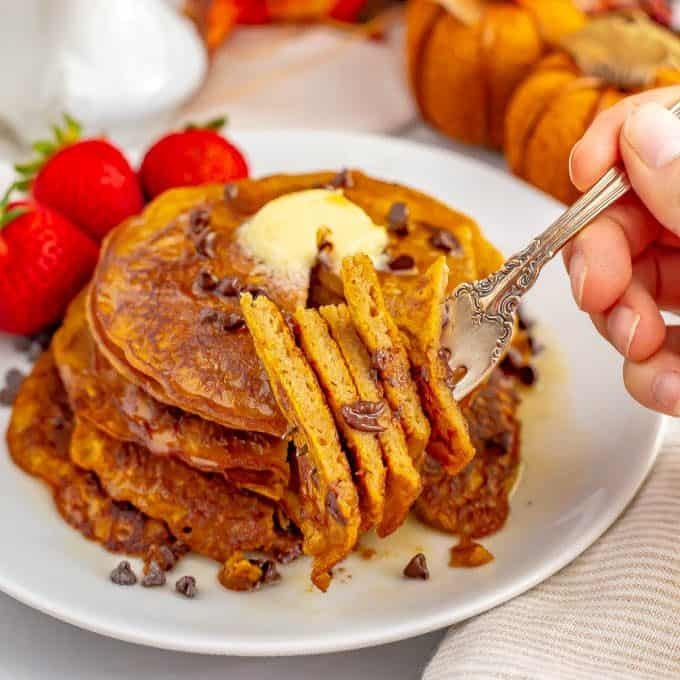 However you serve them up though, I hope these easy whole wheat pumpkin pancakes become a new fall breakfast favorite in your house! 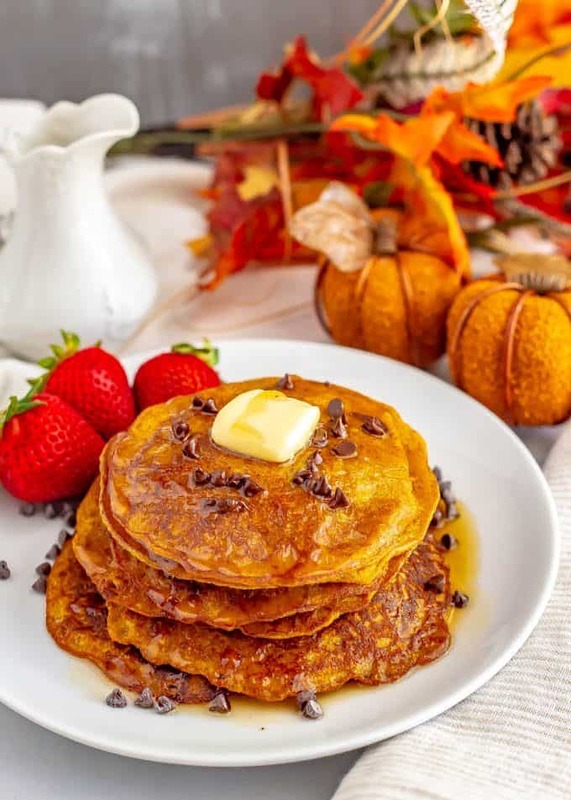 Whole wheat pumpkin pancakes are light, fluffy, and full of warm spices and pumpkin flavor! In a large bowl, whisk together the pumpkin puree, milk, maple syrup, butter, egg and vanilla extract. 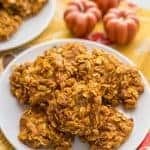 Add the flour, pumpkin pie spice, baking powder, cinnamon and salt and stir until just combined, being careful not to overmix. It's OK to have some lumps. Heat a griddle or large sauté pan over medium heat. Add butter or oil or spray well with cooking spray. Add a heaping 1/4 cup of the pancake batter for each pancake, leaving room in between the pancakes. Cook for 3-4 minutes, until bubbles begin to form all over the edges and the top of the pancakes. Flip the pancakes over and cook an additional 2-3 minutes, until set. 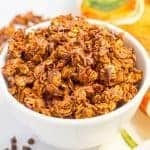 We love these topped with just a little butter and maple syrup, but they also pair great with chocolate chips.